The time between Samhain and Yule flew by. In addition to the normal holiday madness, my husband and I have been busy starting a new business. My husband is a very talented woodworker, specializing in turned wood products. For years, whenever I needed something for my altar, he would make it for me out of wood if he could. I love the feel of wood, especially the local woods of the Adirondacks. I have beautiful pieces all around the house that were turned from logs that came off our woodpile. We’ve joked that at the end of a particularly cold winter we will be burning wood bowls to stay warm. After much discussion about the growing pile of bowls and other designs, we decided it was time to share the creations with the world. We’ve just opened a shop on Etsy. You can find it here. Reclaimed wine bottles make awesome incense burners. 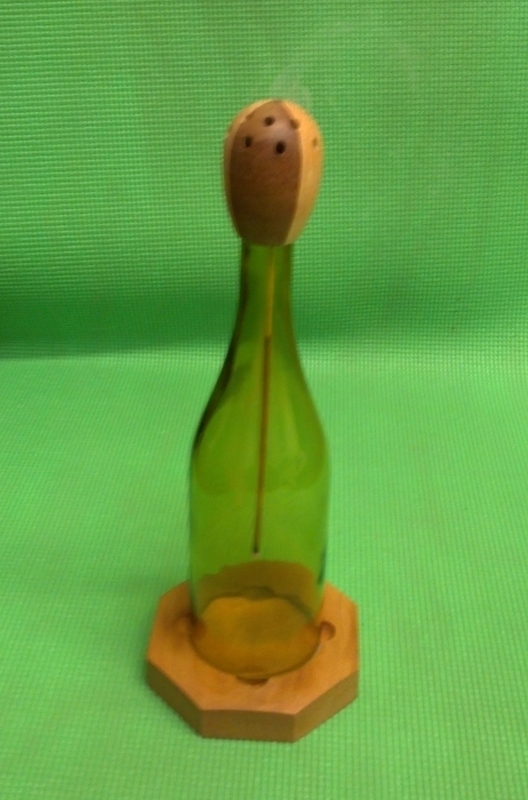 One item that’s there now is a reclaimed wine bottle incense burner. If you saw the post with my Samhain altar, you saw the incense burner he made for me, right in the middle. Burning incense in wine bottles isn’t new, but these are a unique design. The bottom has been cut off the bottle and it sits on a wood base, so I can easily empty the ash. I can also put the glass bottle in the dishwasher to clean off the soot that sticks to the inside, keeping it clear so I’ll always be able to see the smoke swirling around inside. The other unique feature is the turned wood top. It has a wire spiral underneath to hold the incense stick. As the smoke comes out through the holes in the top, it makes a number of separate curls that snake around each other, sometimes blending together, sometimes going in different directions. It’s mesmerizing to watch and makes an interesting focal point for meditation. I wish I could capture the smoke in a picture that would do it justice. See the incense burner on Etsy by clicking here. This entry was posted in Enchanted Home and tagged Business, Crafts, Etsy, Incense, Samhain, Shopping, Wood. Bookmark the permalink.